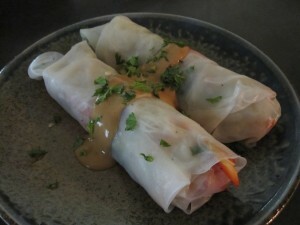 Spring rolls are perfect for the summer season when you do not want to turn on the stove. These recipes includes cilantro and mint for cooling the mind and body. Place the rice noodles in a medium bowl. Cover with boiling water and soak for 8 minutes, or until the noodles are softened. Once soft, rinse in cold water and drain well. Set aside. 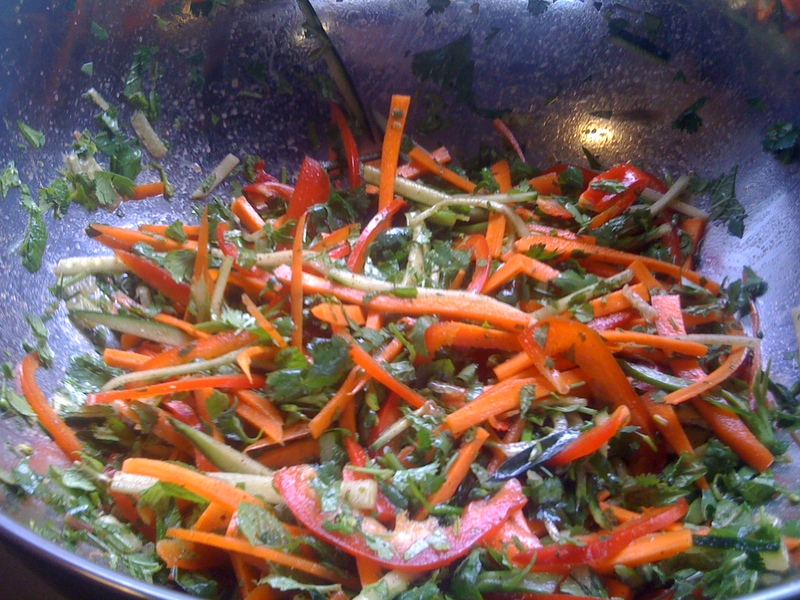 In a large bowl, combine the carrots, green onions, cucumber, red pepper, olive oil, cilantro, mint salt and pepper; toss well. Place equal parts of the vegetable mixture and rice noodles, in the center of the soaked* rice paper, about a 1/2 c total. Fold 3 sides over, then tightly roll towards the last long edge. Place on a plate seam side down. Serve with peanut sauce and garnish with mint and cilantro. *Note: To soften the rice-paper, fill a large bowl with warm water. Dip each rice-paper separately into the water for 30-60 seconds, or until softened and translucent. Do not stack the rice papers; they will stick together. Whisk all ingredients together. Serve with the spring rolls, garnished with mint and cilantro.